This model is a handheld radiation detector that detects potentially harmful ionizing alpha and beta particles, and gamma and x-ray radiation, with an external probe, and has a four-digit, LCD digital display of either millirem (mR) per hour and counts per minute (CPM); or microSieverts (μSv ) per hour and counts per second (CPS), and function indicators, and comes with a carrying case with probe cover. This radiation detector can detect low levels of the four main types of ionizing alpha and beta particles, and gamma rays and x-rays over automatic operational ranges. It is optimized to detect small changes (low levels) in radiation levels and to have high sensitivity to noble gases, and many common low energy radionuclides. The microprocessor-based Inspector has automatic operational ranges for a variety of radiation detection applications. A red, flashing counter, and a beeping noise indicate each ionizing radiation change event. The display updates every three seconds. At low background levels, which are typical in a geographic area, the update is the moving average for the most recent 30-second time period. The time period for the moving average decreases, as radiation levels increase. It counts ionizing radiation changes, with the user-configured unit of measurement. The display shows various indicators, based on the mode setting, the function performed, and remaining battery power. Depending on user settings, display includes low battery, alert, timer, total mode (to see the number of times a reading should be multiplied by to obtain the correct radiation count), calibration mode, utility menu (timer, calibration, alarm set mode), and units of measurement settings. 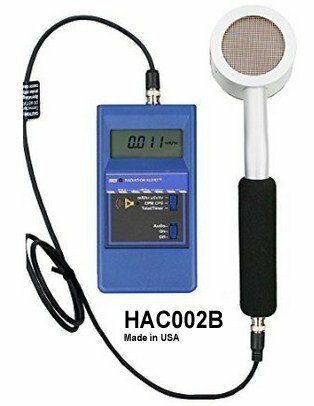 The HAC002B Inspector radiation detector comes with a RAP-RS1 external probe with a halogen-quenched, uncompensated Geiger Mueller (GM) tube with a 2” (thin) window for sensing ionizing radiation, and can be used in a variety of applications. The radiation detector is used for surveying naturally occurring radioactive material (NORM) contamination, gross wipe counting, contamination inspection of packages, equipment, and people, regulatory inspections, and for low energy radionuclide detection. This detector has a utility menu on the back of the unit. The menu has a three-second response, and switches the detector from mR/hr and counts per minute (CPM) to μSv/hr and counts per second (CPS). It also can reset the calibration factor to 100, adjust calibration, and reset all settings to the default factory setting. The Inspector EXP radiation detector has an audio indicator with an internally mounted beeper that can be turned off for silent operation. It comes with a carrying case that provides a full view of the display widow and access to controls. The carrying case has hand straps, a belt loop, and probe attachment capabilities to allow for one-handed operation. A reinforced probe cover prevents detector damage. Radiation detectors can detect a broad range of ionizing alpha and beta particles, and gamma and x-rays that may be emitting harmful levels of radiation. They sense ionizing radiation with an enclosed Geiger Mueller (GM) tube to count radiation particles or rays. Alpha and beta particles are measured in counts per minute (CPM) or counts per second (CPS). Gamma rays and x-rays are measured in milliRoentgens (mR) per hour, microSieverts (μSv) per hour, or milliSieverts (mSv) per hour. Alpha particles are positively charged and heavier than beta particles, and have a limited range of approximately 3 to 5 centimeters by air. Alpha particles can be shielded by objects such as paper and unopened skin. High-energy beta particles are electrons, heavier than gamma rays, and can take either a positive or negative charge. Beta particles can be shielded by aluminum or wood. High-frequency (short wavelength) gamma rays are the strongest and lightest rays. Gamma rays are more penetrating than alpha and beta particles. They can be shielded by dense materials such as lead, and large masses of concrete, hardened steel, or water. X-rays are man-made gamma rays, and have essentially the same properties and function. Radiation detectors commonly have either an analog or a digital display. Analog radiation detectors output with a needle-point scale, and digital units generate a numerical LCD digit display. Radiation detectors are commonly used by hobbyists for safety detection and rock inspection, and professionals in the in the nuclear, medical, mining, instructional, and research industries. SE International manufactures radiation detection products and accessories under the Radiation Alert brand. The company was founded in 1979 and is headquartered in Summertown, TN.